Perfect location near downtown, Quinpool, and the Citadel. My husband had a heart attack. The front desk and restaurant staff were very understanding and helpful. My husband has a heart attack. The front desk people were very helpful and understanding! Pool area was great. Floors were very slippery but nice to see a sauna not a lot of places still have them! Professional staff. Breakfast buffet was very good. It had a lovely leisure area, and very nice view from the restaurant, plus the food was great. Amazing staff...courteous, friendly and helpful. No wash clothes in bathroom and tub did not drain very well. Great location, great restaurant and convenient underground parking although expensive. Beautiful pool room with a hot tub. The room was average, but more than good enough for the price. Location isn’t in central downtown, but is still good. Atlantica Hotel Halifax This rating is a reflection of how the property compares to the industry standard when it comes to price, facilities and services available. It's based on a self-evaluation by the property. Use this rating to help choose your stay! 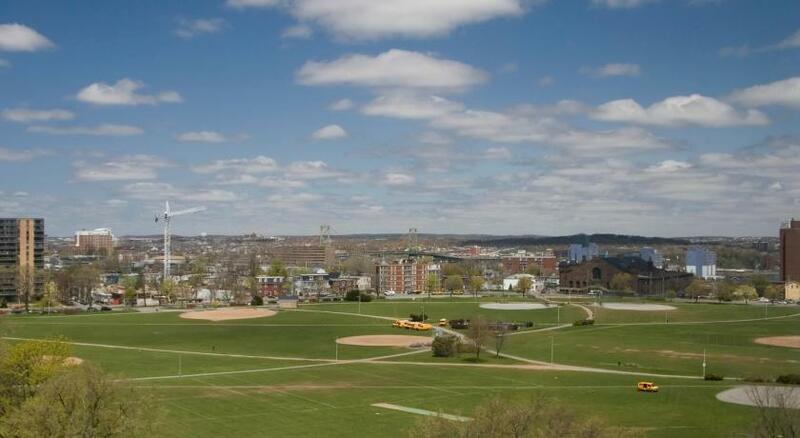 One of our top picks in Halifax.Citadel Hill and Dalhousie University are minutes from this Halifax, Nova Scotia hotel. Each room includes free WiFi. A fitness center, an indoor pool, hot tub and sauna are on-site at the hotel. Guest rooms at the Atlantica Hotel Halifax features a flat-screen TV with pay-per-view movies. A seating area and a work desk are included. Select rooms provide bathrobes. The Seasons by Atlantica Restaurant and Lounge is located at the Hotel Halifax Atlantica. This pet-friendly hotel provides an on-site cash machine and a free limo service to downtown Halifax. The Casino Nova Scotia is located in close proximity to the Atlantica Halifax Hotel. The Pier 21 Museum is also a short drive from the hotel. When would you like to stay at Atlantica Hotel Halifax? Located on the 14th and 15th floors of the hotel, these rooms boast unobstructed views of the Halifax Commons or tree-lined streets of the city's south end. The room provides free WiFi and a flat-screen TV. Additional amenities include a free daily newspaper (Monday - Saturday), bottled water, in-room coffee service, a mini-fridge and a clock radio with iPod connection. The private bathroom offers bathrobes and complimentary NEST toiletries. Guests will receive a complimentary hot breakfast each morning in the Seasons by Atlantica restaurant, appetizers from 17:00 until 18:00 in Seasons Lounge, and free calls within North America. Located on a higher floor, this room includes free WiFi and a flat-screen TV. Additional amenities include a free daily newspaper (Monday - Saturday), bottled water, in-room coffee service, a mini-fridge and a clock radio with iPod connection. The private bathroom offers bathrobes and complimentary NEST toiletries. Guests in this room will receive complimentary bottled water and a CAD 20 voucher for the on-site restaurant. This room includes free WiFi and a flat-screen TV. Additional amenities include a free daily newspaper (Monday - Saturday), in-room coffee service, a mini-fridge and a clock radio with iPod connection. The private bathroom is stocked with NEST bath products. House Rules Atlantica Hotel Halifax takes special requests – add in the next step! Up to three additional older children or adults are charged CAD 20 per person per night when using existing beds. Atlantica Hotel Halifax accepts these cards and reserves the right to temporarily hold an amount prior to arrival. Please note the hotel's on-site parking is underground. A security deposit of CAD 100 is required upon arrival for incidental charges. This deposit is fully refundable upon check-out, subject to a damage inspection of the property. I did Not like the fact we had dirty sheets with stains and black hairs on them.. having WET towels in the bathroom on the back of the door as if they were not removed. A leaky sink on day two of our stay and the gate for leaving the parking only worked when it felt like it... our door was opened around 930am when we were sleeping and woke up to leave our receipt.. when i told the front desk lady rolled eyes. Kidden charges in the stay also. Beware. How close it is to things is nice. The staff member who checked me in Saturday April 20th at 7:45pm was amazing. He offered me a free upgrade as it was my first time staying at Atlantica! Room had a stale smell. The room was dusty,spilled drink still on night table, hairs in the bathtub,bed uncomfortable. There was a constant high pitch noise in the bedroom all night. Tub was rusty and the Nest soap provided had been previously used by the presence of small dark hairs and lack of plastic wrap (kinda gross). There was only one light blanket on the bed, no extra in the closet which made for a bit of a chilly sleep. Room was reminiscent of the 90s, but clean. Construction next door begins at 7am, not ideal for light sleepers wanting to sleep in. Curtains were busted at the top, managed to wiggle them closed. Proximity to downtown was great and the staff was friendly. Very quick check in and out. Bed and pillows were comfortable. One of the better options for wanting a decent place to stay within walking distance (20 min) to downtown without paying an arm and a leg.